Sometimes we come across a recipe so simple and brilliant that it makes us ask ourselves what we've been doing our whole lives. Oreo upside-down cake is one of those recipes. Food blog Sally's Baking Addiction shared a recipe last spring for an Oreo Cake in which the cookies are set in the bottom of the cake. Thanks to Delish.com, this recipe just resurfaced and is getting recognized for what it really is: an Oreo upside-down cake and nothing short of a baking breakthrough. The recipe calls for setting about 15 Oreos in the bottom of a cake pan, and pouring cake batter on top of them. When the cake has finished baking, the Oreos will have set into the batter. This recipe takes things to another level by calling for two cakes, between which is spread a layer of frosting. Are you getting the picture yet? Your chocolate cakes will sandwich the "Oreo cream filling," creating a giant Oreo cake, with real Oreos built into the batter. So meta. What's even more exciting about this Oreo Cake is that it's not just one recipe: it's a concept that can be replicated with other cookies. If an Oreo upside-down cake exists, why not a chocolate chip cookie one? Upside-down cakes typically come in the pineapple or pear variety; sometimes they'll be made with peaches or rhubarb, plums or even blueberries. But cookies? It's a concept so clever it's remarkable that it's so unexplored. We're officially entering the Oreo upside-down cake -- and any cookie cake that follows -- into the "Why didn't we think of that?" cannon, where recipes the likes of Cheetos mac and cheese and pepperoni pizza grilled cheese belong. 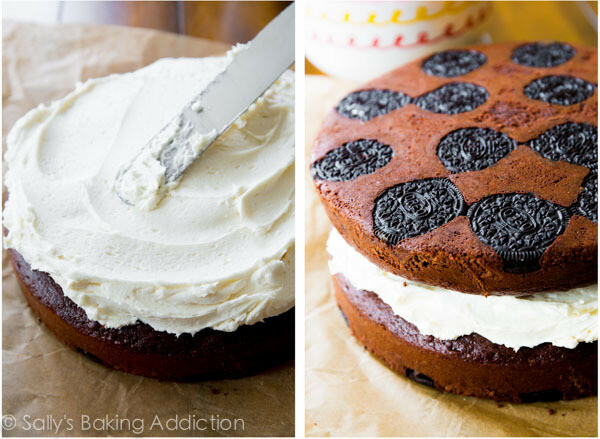 Get the Oreo Cake recipe from Sally's Baking Addiction. What kind of cookie upside-down cake are you going to try?